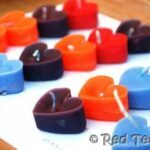 Welcome to this week’s How To – “How to make candle wicks”. As you know, I love to recycle and each year at Christmas we are left with a lot of old, but perfectly good candles. As a child I once received a candle making kit and loved it. 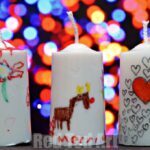 I wanted to have another go at making candles – but with things from around the house. To start off I needed some candle wicks. So I looked up how to make candle wicks and found that the recommendations varied. So. 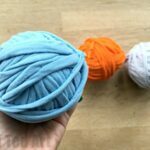 I made 3 different types and tested them! 3) Place somewhere to dry (e.g. an airing cupboard). The cotton must be FULLY dry before you proceed, so you may want to wait 2-3 days! 5) Dip the string, hang it. It will dry very quickly. 6) Dip again. As my can wasn’t very full and my string was very long, I fudged this a bit and just poured more wax over my wicks, then dried those on some foil. 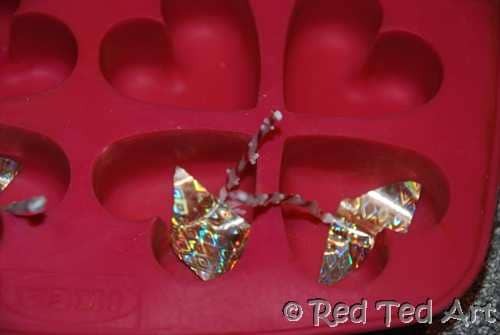 In order to test the candles, I thought I make some little ones – The only ice cube try I could find was our heart shaped one – which actually turned out quite pretty. 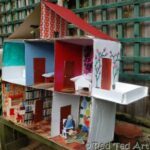 I got a carried away and made lots – the kids were fascinated! 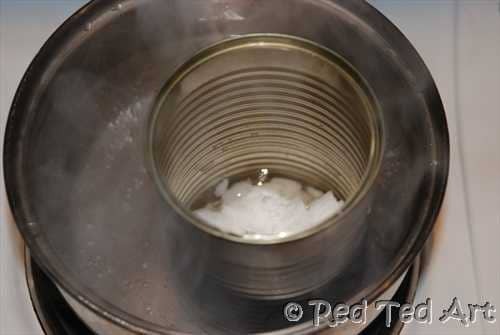 1) Melt your wax in the tin, which is sitting in a bath of water. I probably filled the tin half way with white wax. I used an old pan of ours, you won’t ruin it, but wax can be a little tricky to clean off, so you may as well use an old one! 2) Tape down your wicks (I could only find my gold tape, but needless to say normal tape is fine, if not better). 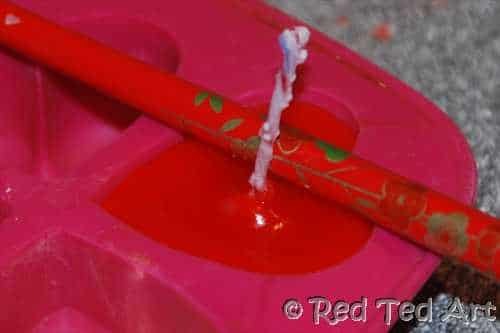 Once you add the hot wax, it will melt the wax on the wick, making it all floppy and wanting to float. I found the tape then stayed on the candle. So I later tried it with blue tack. Which work just fine, but got really “weird sticky” and was hard to remove from the ice cube tray. Your call. If you want a really professional finishing, then tie your wick to a toothpick and suspend it properly or hold it place with a cloth peg (but then you can’t fill your ice cube tray to the top. 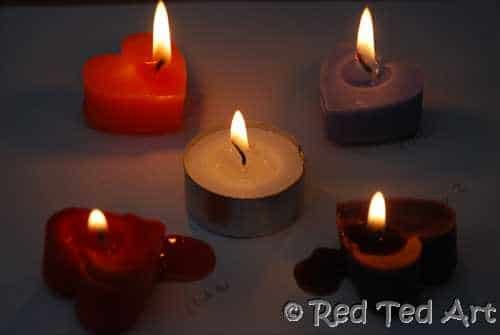 Personally I was too lazy, afterall these are test candles. So see step 3. 3) Poor in the hot wax. As it starts to set, prop up the candle wick. Don’t do it too early, it will just fall over or too late, as it will make a mess of your candle surface. This is fiddly and trial and error. And yes, this is where tying to a toothpick is beneficial. 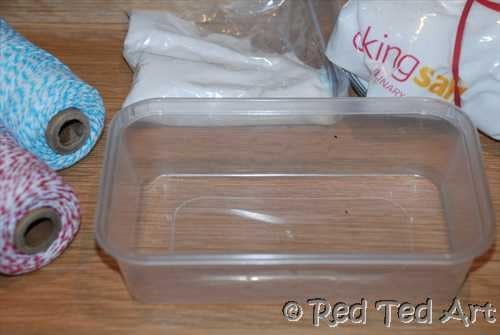 4) Once cooled, pop out of your trays and done. You will find that your wax contracts and that you will get a dip in your candle. You can always top up your wax, but you may create visible layers in the finished candle. It is really just a matter of preference. I don’t mind the dip (too much). These test candles actually turned out very prettily. 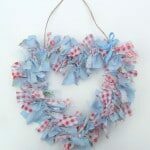 And I am going to wrap them in some cellophane and curling ribbon and give these as small presents! Out of ALL the candles the borax left overnight sample had the best flame – it shone taller than the “real wick”. All candles burnt the same amount of time. Though the “plain” and the “short borax solution where at risk of drowning in the wax, as their flames were low. If poured away, they lasted longer. So… my advice? Make your candle wicks with borax and leave them overnight. It doesn’t take that long and the flame is much more impressive. 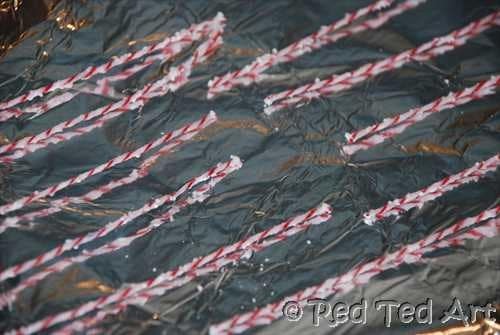 However, if you really want to make “candles today” and didn’t have time to make or buy a wick, then you can get away with some cotton or embroidery floss dipped 3-4 times in wax first! 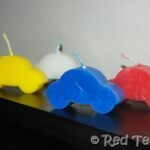 Hope you have fun making your own candle wicks and do have a go at candle making it is great. More “candle” ideas to follow. Oh how awesome.I have a candle making kit that I bought froma second hand shop that I’m going to use now.The prices of moulds put me off so I’ve left it under my bed. Been looking all over to ask a question. 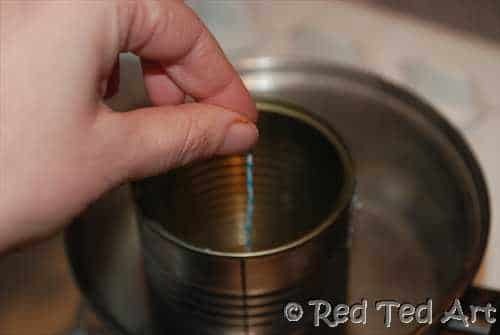 Of all the Home made wick making articles, I haven’t seen one that mentions the crystals that form when you take your string out of the Borax, salt, and water solution. So, what do you do about them. Why doesn’t ANYONE mention that in their turorials. I have the string drying now crystals included. This is great…but I have no idea what Borax is….I keep thinking of an eastern european in a mankini! Borax can often be found in the laundry section of your supermarket/grocery store. A common brand is Mule Team. Borax is used for alot of household things. The biggest one is for fleas, You can use it to clean with an wash clothes in. You should be able to find if at a walmart or at a grocery store. Hope this helps. This is a great experiment! Thanks for the info. I hope it’s alright that I linked to it from my web site. I made candles using just the cotton thread and they did work well. 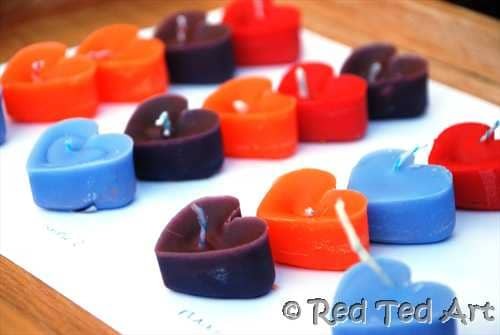 I use the coin shaped wick ‘stands’ from the bottom of used tea lights (and other wide candles) to make new candles. You can reuse them over and over. You just push a toothpick through from the bottom to open up the prongs again to get the leftover wick bits and wax out and then close them on a new length of wick. Easiest thing ever. Oooh Jennifer what a great idea!!! Thanks for the tip! These are great tips for priming a wick at home. Another tip is just as the wax creates a thin layer as it starts to cool, jiggle the wick to let air bubbles out and top up with hot wax. Hopefully, you shouldn’t get such an obvious double layer. Thank you! Great experiment. I am so grateful for your work, and for the work you saved me. 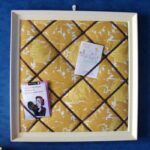 I’m making these now – Thanks! But, after soaking the wick in the borax & salt solution for about 5-6 hours, lots of huge crystals have formed on the twine. Have you had this happen before? I can’t imagine that it’d be good to have candle wicks with these big crystals all over them. Any advice? I’ve pulled them out of the solution & am hanging them to dry. 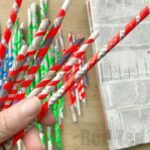 Again – thanks for the tips – this will save me a lot on the candles I’m making! Yes, I had the crystals form too and I just left them on, on my test candles (you can’t really see it in the test photos). Hi, I’ve been experimenting with making a huge candle in an upturned bell jar 9″ dia. I wanted a large flame so just soaked a piece of 8mm thick dressing gown cord and put that in. It works great stays alight BUT smokes a lot and the wick doesn’t seem to burn down. I want it to burn without smoking exessively. Would soaking it in borax help ? I think it may be the cord that smokes a lot? 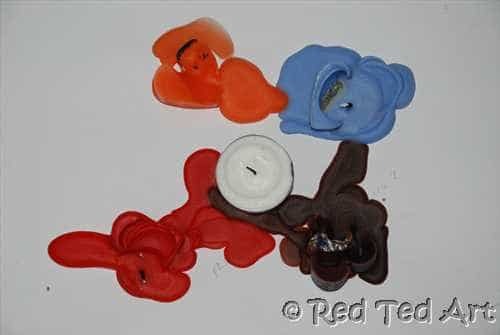 I bought some candle wicks once (did have time to make my own) and they looked just like a cord and was much smokier than my homemade ones? What helped me (!) was to trim the wick and not have it too long? Hi, my candle wicks had some borax crystals too but once I dipped them in the wax, they were no longer that noticeable and seemed to be fine? I just reheated the whole solution and the crystals disappeared. Is there one method other than the above that would make the wick last longer than norm. I am asking this question because there are candles that seem to last longer than the norm. you can also add essence to the wick as you make it – I love vanilla and natural ones, they smell fantastic! as the candle burns. I also add some into the melted wax to have a lovely smell. Lavander is always great in the home at night. Ooh lovely suggestion, thank you. Thanks for such a detailed explanation! I’ve tried making my own wicks for small and large container candles using cotton string, braided. I used the overnight method, and the wicks worked really well but after burning a couple hours, they fall over and drown in the melted wax! Any suggestions for how to keep them standing without using wire? Maybe it’s the string? Mmmh, that is a good question! I would have suggested braiding them – but you have done that already..? Yes, I’ve braided them. I’m going to test again using a full-sized candle and wick — I’ve been testing only small amounts and maybe it’s just after all the wax is liquified that the bit of wick falls. I’ll let you know if that works! I really wanted to make candles yesterday since I was off work but ran out of wicks. So I soaked my cotton yarn (Lily’s Sugar’n’Cream) for about three or four hours, then threw it in the dryer on high for a full cycle. Since I was cutting it up anyhow, the tangles didn’t really effect it. Then I dipped four or so times. Wow! This wick is way better than the store bought ones and I made a ton, at least 100 feet, in probably 30 minutes! Well done. Thanks especially for showing your comparison of results! I made some of these and I got a 3″ flame!!! Yay – but take care with flames like that!!!! what a great idea!!! Thanks for the tip!